Saturated with blue? 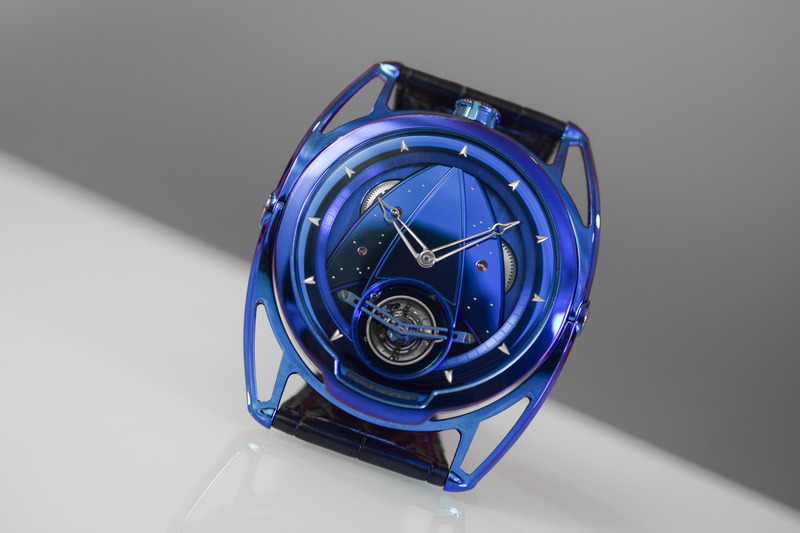 De Bethune exposes its DB28 to the heat of the sun and raises the temperature of its celestial voyager. 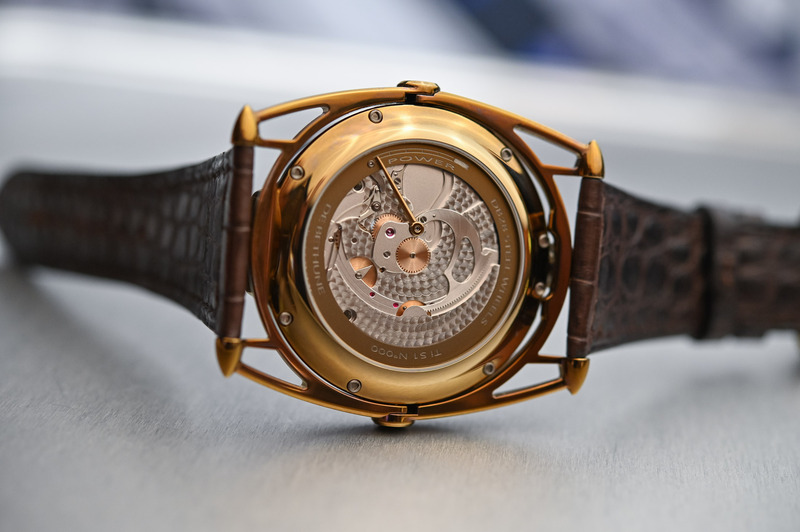 In a radical departure from De Bethune’s hallmark heat-blued titanium colour palette, the DB28 surprised us at Basel 2019 with its two-tone golden suit. The transition from cool cosmic blue to warm radiant gold raises the temperature on the DB28 and gives the watch an entirely different personality. 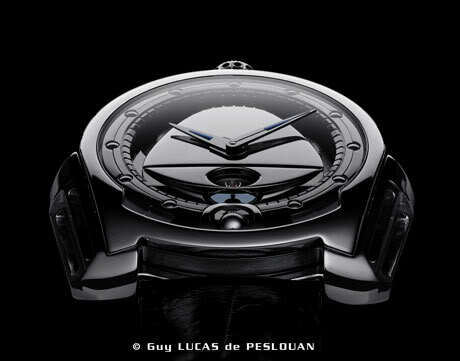 Packed with six patented De Bethune technical goodies, the other significant novelty regards the floating lugs. We enjoyed some hands-on time with the new DB28 blonde bombshell and this is what we found. My first impression was that the DB28 watch was wearing a fashionable bronze suit. Or was it a combination of rose gold lugs and a yellow gold case? 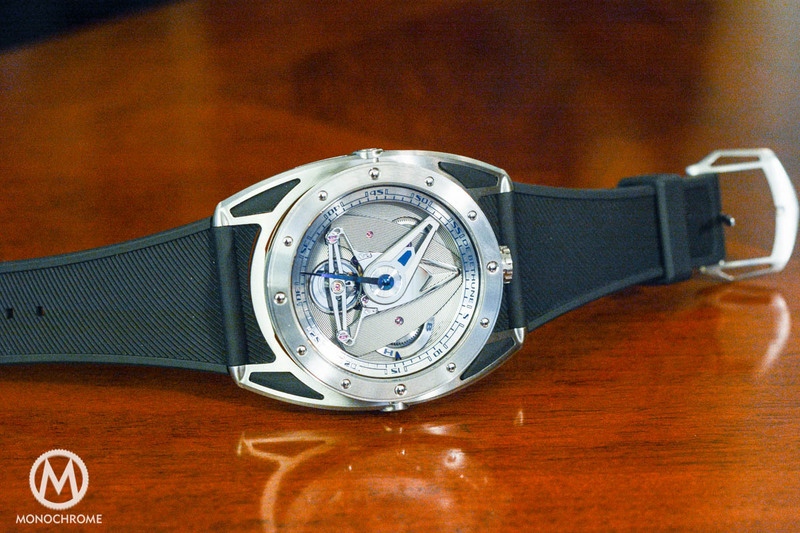 However, the feather-light weight of the watch was a dead giveaway that we were dealing with titanium. Could it be a PVD treatment then? 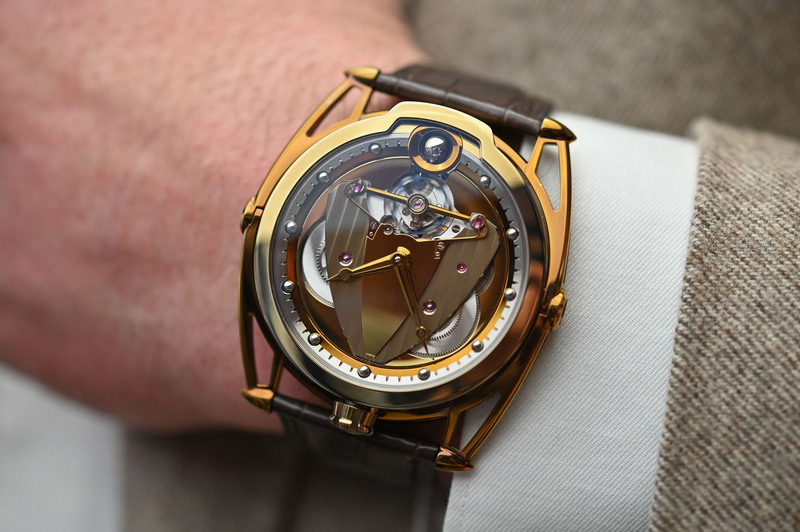 No, that is definitely not in line with De Bethune’s refined approach to watchmaking. The sun-kissed golden colours of the DB28YT are, we soon discovered, the result of a chemical reaction produced by heating the titanium – something of an in-house speciality at De Bethune. 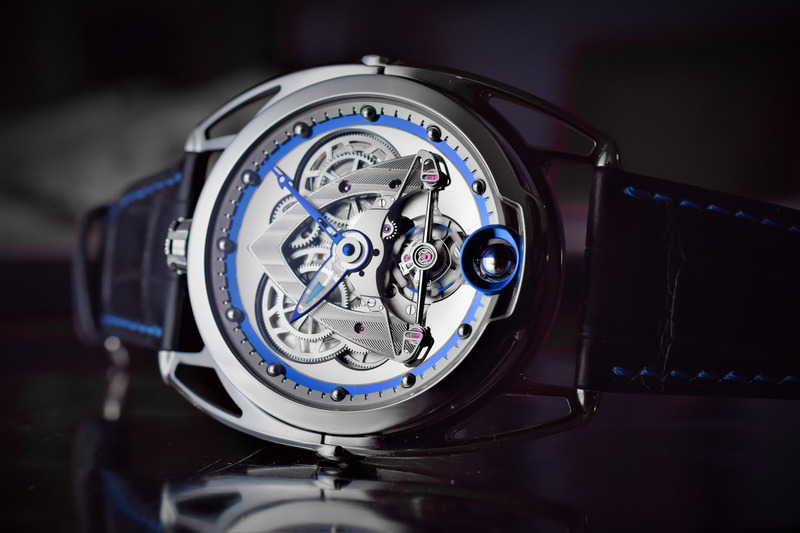 Heat-blued titanium is the colour/metal we all associate with De Bethune, a mysterious tone of blue that evokes the cosmos and works perfectly with the avant-garde, sci-fi aesthetic of the brand. ‘De Bethune blue’ was discovered quite by accident in the lab, for technical and not aesthetic reasons. Having selected titanium for the production of balance wheels, Denis Flageollet noticed that they were not stable and decided to stabilize them with the same heat-blued treatment used on steel. When fired at over 700 degrees Celsius, the titanium became stable and to boot, emitted an out-of-this-world colour. 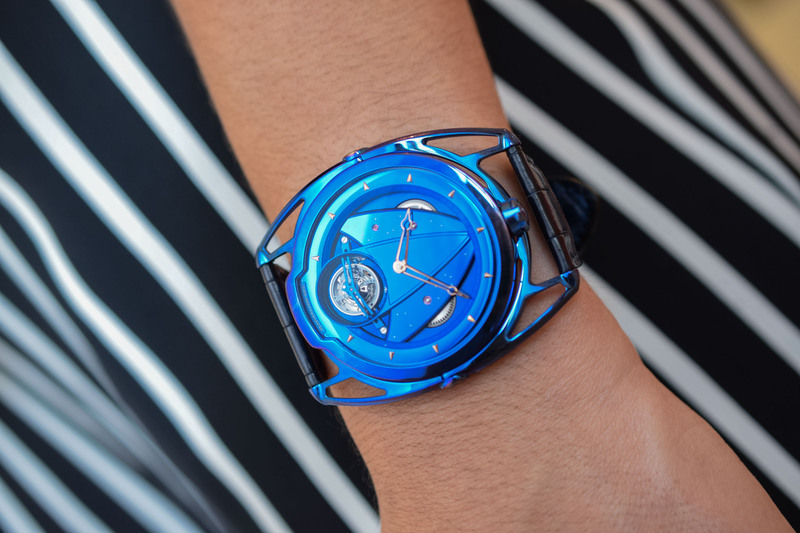 Chatting with the De Bethune team at their stand during Baselworld 2019, we discovered that the decision to move into Midas territory was because of the current invasion of blue dials on the market. Can you think of one brand without a blue dial? To give its famous De Bethune cool blue a time out, De Bethune has adopted a warmer colour palette of golden yellow tones. As you have guessed, the alchemic ritual is still very much part of the formula and the grade 5 titanium is gently subjected to thermal oxidation to coax natural colours to emerge from the dark depths of titanium. Described by the brand as ‘amber and flame blonde’, the two-tone colour scheme brings a mellow yellow vibe to the DB28. 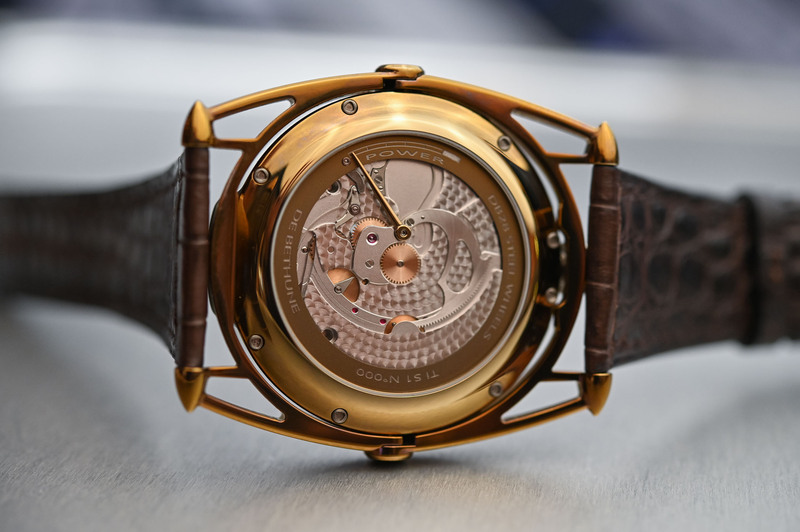 The thermal treatment is not exclusive to the case but manually executed on most of the parts of the movement. This means that each tiny part has to be analysed individually because the thermal process has to be adapted according to the form and mass of each component. 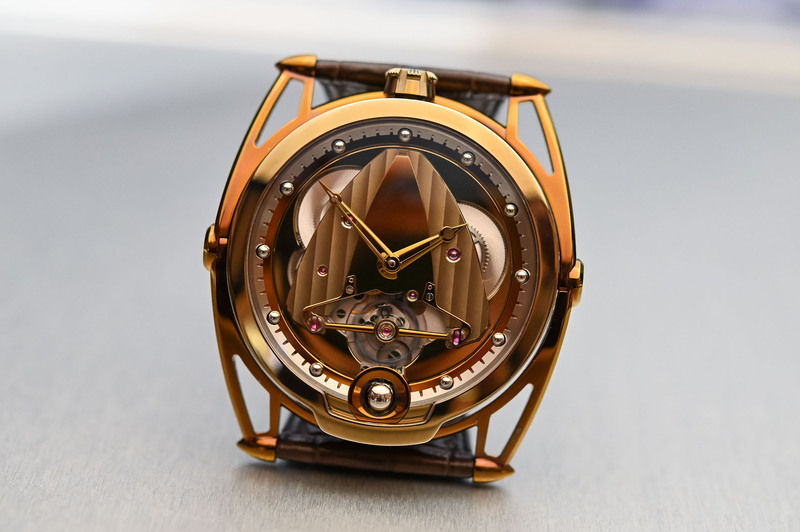 The fact that there are different materials inside the movement means that the reaction is not always the same and a range of subtle colour differences add depth and interest. 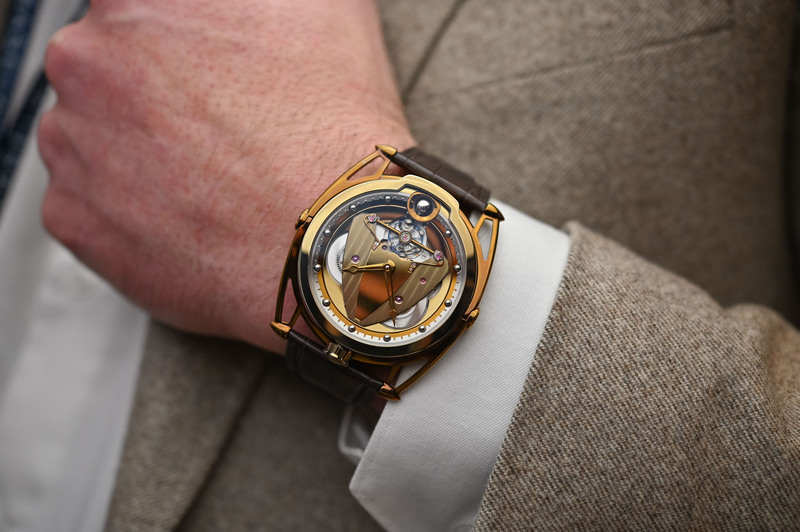 Not only is the watch feather-light thanks to its titanium case, but the mirror polish on the metal also makes the golden surfaces behave in myriad tonalities – depending on the light. Mirror polishing is the result of hours and hours of hand polishing using diamond paste on a boxwood peg. 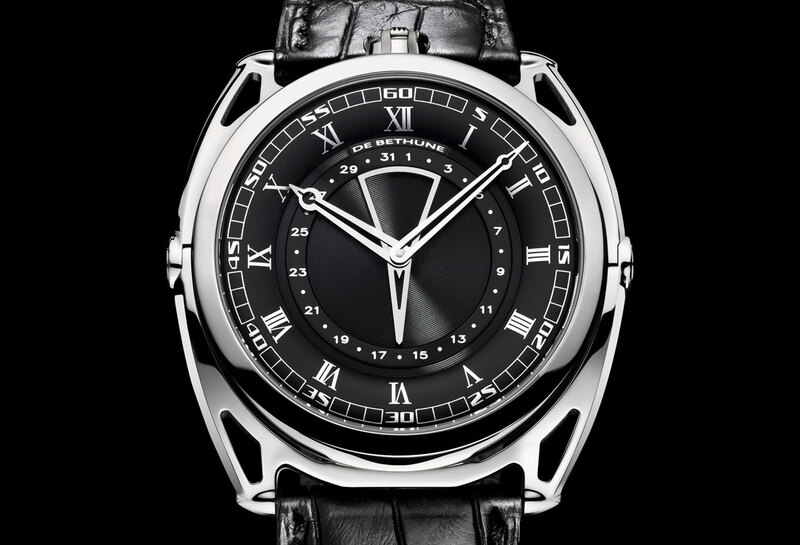 De Bethune’s DB28 model is the backbone of the brand with its pronounced floating lugs, delta bridge on the dial, crown at 12 o’clock and futuristic look. 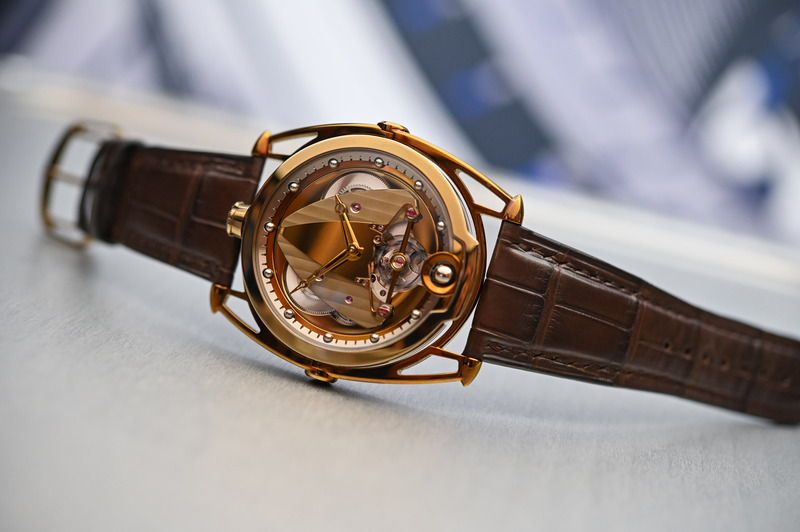 The DB28 won the coveted Aiguille d’Or at the 2011 edition of the GPHG. It has adopted various guises over the years from the Kind of Blue Tourbillon version of 2018 with a cosmic blue suit; the 2018 Steel Wheels with a skeletonised movement; the 2015 Black Matte version; the sporty DB28GS; the all-black Dark Shadows; and even a somewhat anachronistic digital verion in 2014, the DB28 Digitale. Crafted in yellow polished grade 5 titanium, the 42.6mm diameter of the case (9.30mm height) is standard DB28 fare with the crown at 12 o’clock and the patented floating lugs. The main difference between this DB28 and former models is a design tweak on the floating lugs. The lugs, picked out in contrasting brown polished titanium, have been revisited to capture the spirit of the first De Bethune collections. If you look closely at the tips of the spring bars that traverse the alligator strap, you will see that they are bullet-shaped, unlike the rounded edges of former versions. The lugs adapt beautifully to the wrist but there is no escaping that this is a large watch. There was something else that struck us about the DB28 Yellow Tones. 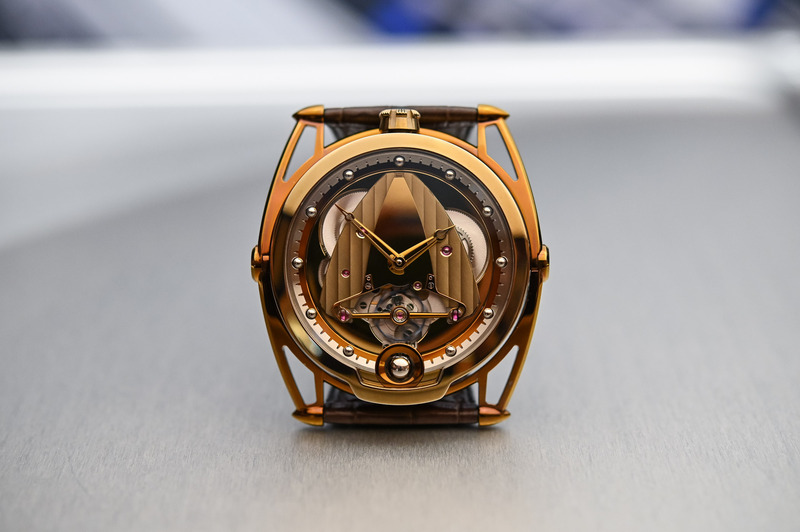 Unlike a watch of these dimensions and this level of mirror-polished surfaces in solid gold, the DB28 was not conspicuous or loud, in fact, it came across as warm but definitely not brazen. The De Bethune DB28 Yellow Tones achieves volume and depth on the dial with the juxtaposition of different finishes, the incorporation of 3D elements, and the recessed openworked area revealing the hand-snailed barrels and the balance wheel. 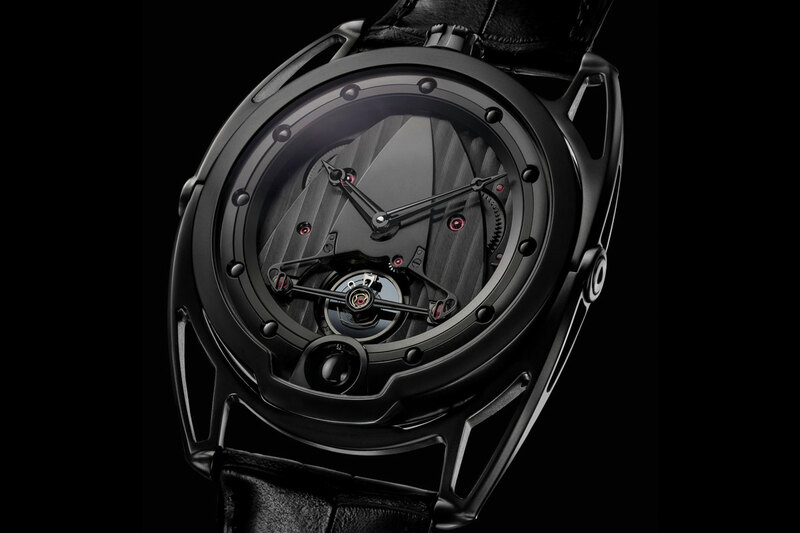 The dial is permanently animated by the gyrations of the exposed titanium balance wheel. Occupying a large part of the dial is the signature delta (arrow-shaped) bridge that always reminds me of the Starfleet Commando logo in Star Trek. 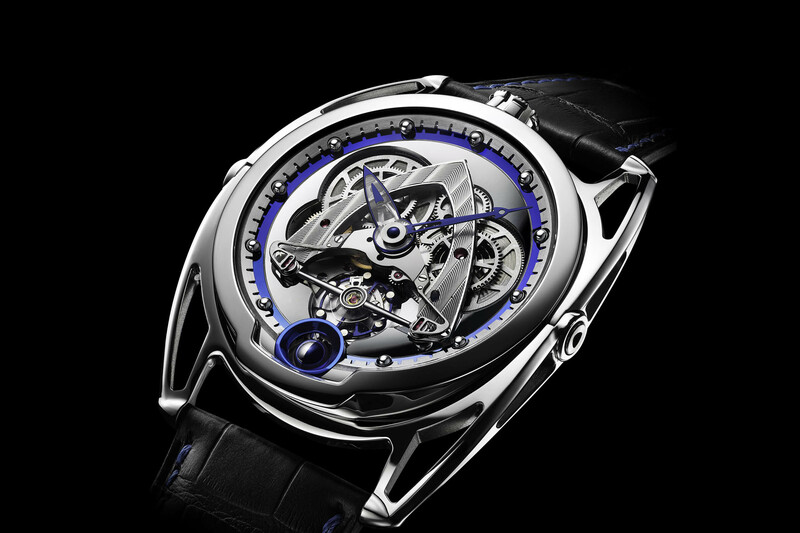 The yellow titanium bridge features Côtes De Bethune stripes and a dynamic polished central area. The skeletonised hands keep the view as open as possible. Just above the moon phase indication is the exposed titanium balance wheel with gold inserts and the silicon escape wheel. The two-tone spherical moon sits inside a browned and polished titanium circular frame at 6 o’clock. Two hemispheres, one made out of palladium and the other of flame-browned steel, form a 3D moon that can indicate the age of the moon with an accuracy of one lunar day every 122 years. The hours ring provides a dynamic contrast to the golden colour scheme and is picked out in a natural tone of titanium with circular graining and 11 spherical and polished markers set on a brown titanium circle. The DB28YT is fitted with calibre DB2115V4, a manual-winding movement with a very respectable power reserve of six days thanks to the twin barrels. 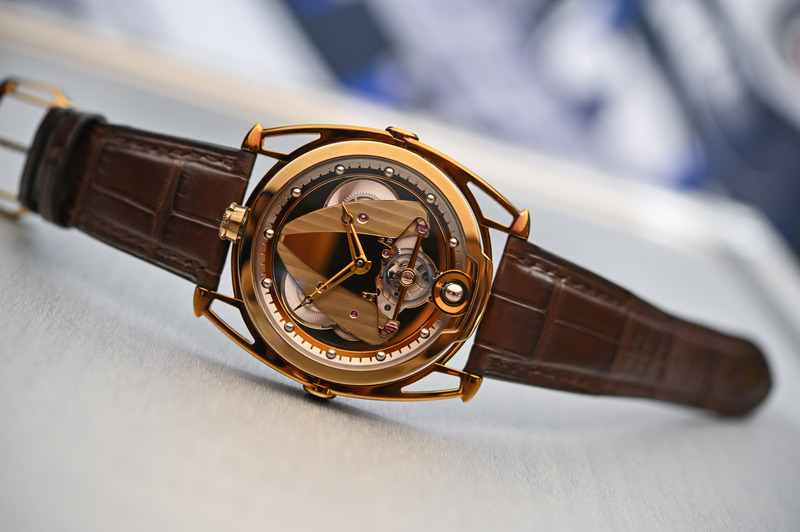 A linear power reserve indicator in browned steel decorated with circular graining is revealed on the caseback and the movement benefits from innovative and patented features like the De Bethune balance spring with flat terminal curve, the spherical moon phase indication accurate to one lunar day every 122 years, the triple pare-chute shock-absorbing system and the self-regulating twin barrels. As with all De Bethune’s creations, the finishes are top notch and all the steel parts are bevelled and polished by hand. The DB28YT comes on a supple, brown alligator strap with a yellow titanium pin buckle and retails for CHF 95,000. For more information, www.debethune.ch. It’s extravagant and ever-so-slightly bling, but still strikingly beautiful. I loooooove this. The blue version is a bit outre. But the gold is sublime. However, unless I find one at a garage sale and the seller thinks it is a Star Trek watch, I will never be able to afford one.